Inheriting the feel and the tone of Vintage Jazz Bass, this 4-String bass will broaden your performance possibilities and with it's high quality preamp, it provides modern sounds that will enable you to perform in any environment. Within this bass reside 2 different sounds, vintage and modern. We are now able to offer you the sound quality proven through vigorous professional use, and precise craftsmanship at an affordable price. Inheriting the feel and the tone of Vintage Jazz Bass, this 4 -String bass will broaden your performance possibilities and with it's high quality preamp, it provides modern sounds that will enable you to perform in any environment. Within this bass reside 2 different sounds, vintage and modern. We are now able to offer you the sound quality proven through vigourous professional use, and precise craftsmanship at an affordable price. Trusted for its quality and precision, we chose the Hipshot Ultra lite for the machine heads. They are durable and lightweight, which helps for longevity and prevents head dive. For the XJ-1T, adjustments can be made at the end for the neck with the special hex Allen wrench. There is no need to remove the neck or the pick guard to make the adjustment. Xotic's manufacturing process improves the stability of the neck. 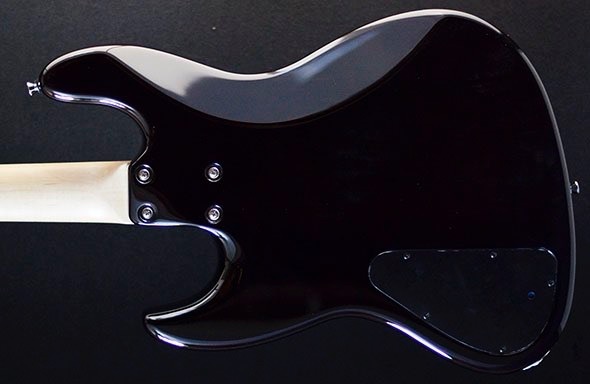 Under normal conditions and use, the neck's consistency should remain strong and steady, but minor adjustment of the Truss rod may be required under harsher environment or changes in season. We've made the adjustments very easy with the placement of the Truss Rod. The XJ series uses custom made brass for the bridge because its brass alloy doesn't lose any vibrations from the strings, giving it fat and solid tone. This bridge provides adjustments to the pitch and tension of each string giving you your own custom set-up. A medium-weight alder/ash materials are used for the body. These woods give the XJ series a solid low and low-mid range tone. Something lighter weighted bodies can't achieve. Our alder bodies feature 2 piece construction, while our ash bodies are 3 piece. The 3 piece ash body construction is more reminiscent of 70's jazz type ash bodies. The XJ 5-string series pickups are positioned with vintage 60's style in mind. This makes the XJ versatile for both slap and finger style playing. The XJ's body style is based on an original Jazz Bass design, but Xotic's vision and enhancements are reflected throughout its design. For example, the rounded heel of the neck joint and the cut away. These improvements significantly improve playability in higher positions and give a stress free feel. We wanted a finish that was strong and would look great after many hours of playing. Our polyurethane finish accomplished our goal and we can now offer a variety of colours, from vintage to more modern shades. The XJ fingerboard tone wood options are Maple or Rosewood. These tone woods are carefully selected and chosen for their hard-grained material. Our fingerboard features a 10" radius, which is a gentler curve than vintage spec, and is adorned with Luminova phosphorescent position markers. These markers are a perfect choice when performing on a dark stage as they glow 10 times brighter and last longer than other comparable materials. Our 5-string models are accommodated with a 22F neck, better adapted for modern style playing. The rigidity of our 5-string necks allow for a solid ringing of the low B, something lacking on other 5-string models. Jescar Fret Wire is an industry standard fret wire that is chosen for its high quality and used by makers such as Gibson, Martin and Tom Anderson. It is trusted for its superior precision and durability. We used the FW9665 model for the XJ-1T series, which has the proper height and trusted stability in pitch. The fret is carefully finished, providing you a stress free feel. For the XJ-1T pickups, we used the traditional Alnico 5 rod magnet, AWG-42 formvar wire, and Vulcan fibre bobbins. Both 4-string and 5-string model have vintage flavour as its base, but with higher gain. The higher gain offers richer sound in both passive and active modes. Our standard pickup configurations include Lindy Fralin custom pickups. We strengthened the magnetic force to improve overall response. This resulted in quality of the tone being brighter with a more solid bottom, which makes these pickups more compatible with our newly developed Tri-logic 2 preamp. We used our world renowned Tri-logic 2 preamp, which has been our choice since the Evolution model. The preamp is designed to minimise the change in tonal quality and incorporates a 3 band EQ. The preamps and EQ makes it ideal for covering a wide range of musical styles. the bridge, so you can instantly switch between high-mid/low-mid and various treble EQ frequencies. The Tri-Logic 2's electrical circuit is redesigned with amplifying element for reduced electric al consumption and noise, for better tone and longer battery life. This flat pickup cover also functions as a finger ramp. There are also thumb rests on the side that are helpful for stabilising your picking. And since the pole pieces are not bare, this visually attractive cover also eliminates the noise from fingers or pick which are prevalent for the Jazz Bass. Xotic Bass Preamp: Three Band EQ (high, mid, low) boost & cut. Centre position produces flat, unaltered sound, with no added tonal coloration. * Pre-set gain control to boost gain by one to three times (located in back panel for easy access). Have you ever wished there was a true single-coil pickup that was as quiet as a humbucker? Then your wish has been granted! Introducing HRI, Hum Reduction Inductor. 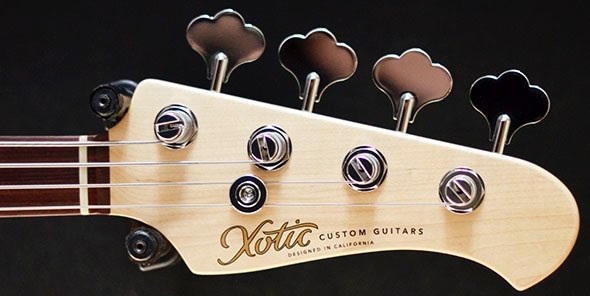 Handmade from carefully chosen materials, by highly skilled Xotic Builders, and strategically installed on each instrument, HRI eliminates that notorious hum noise commonly associated with single coil pickups. Without losing it’s rich tones! It’s only possible by Xotic’s HRI. coils with none of the noise." 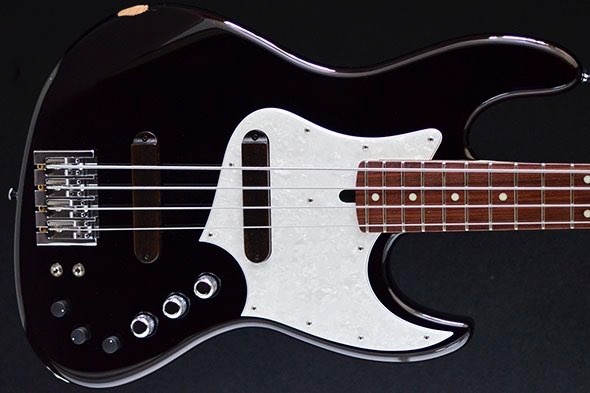 The solid bass guitar, known as the J-Bass style, has always been popular amongst the bass players from the time it was introduced in the mid 1900s. With its high quality ergonomic design, wide variety of tones that provides flexibility to adopt to many different styles of music, and excellent response that enable the players to express their emotions, it is easy to understand why this bass continues to be endorsed by many players. The single-coil pickup installed in the J-Bass is simply a magnetic wire wound to the Alnico rod magnet. Although this simple design is what creates the tone that attracts many players, it also makes it vulnerable to the hum noise caused by the AC source and this has always been a known problem. 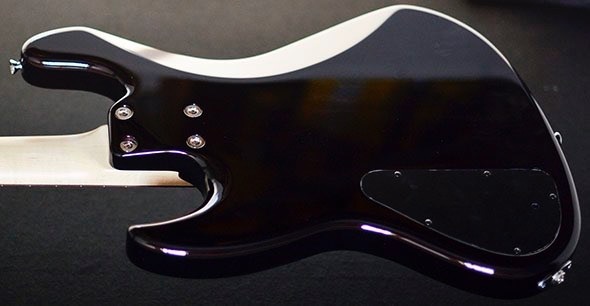 XOTiC/XJ-1T has achieved its popularity with its 2 single-coil pickup design similar to the J-Bass, but it also shares its vulnerability to the hum noise. We have received many requests from musicians to make improvement to this hum noise issue and most of these requests also mentioned how important it was for us to maintain the tone characteristics of the single-coil pickup. One of the most common ways to eliminate this hum noise is use of the dual-coil pickup. It houses a reversed coil that causes a reversed phase noise, which cancels the noise wave. But many players that prefer the tone of the single-coil pickup tend to shy away from dual-coil pickup since its tone is slightly different. HRI was developed to answer this difficult request to eliminate the hum noise, while maintaining the tone of the single –coil pickup. HRI is a device that can reduce the hum noise, while minimizing the coloration of the audio signal from the single-coil. And since it is completely passive, it does not require battery or any other power source. As shown (left), all you need to do is to mount the cavity where the magnetic field radiating from the pickup can’t reach. Since 2 pickups mounted on the J-Bass have 2 different DC resistance value, inductance value and noise level, HRI is configured to be able to deal with each pickups. 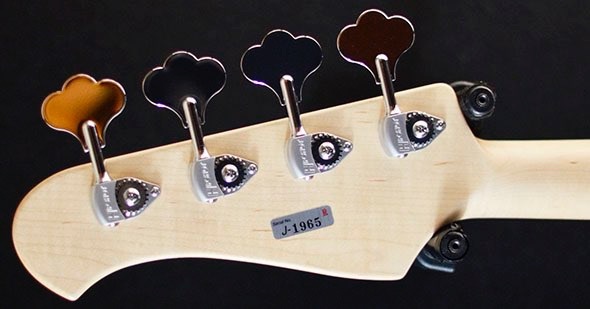 We also added HRI-J4 and HRI-J5 for the 4 and 5 string models to the lineup, making it possible to mount the HRI as an addition to all of our previous XJ-1T models.